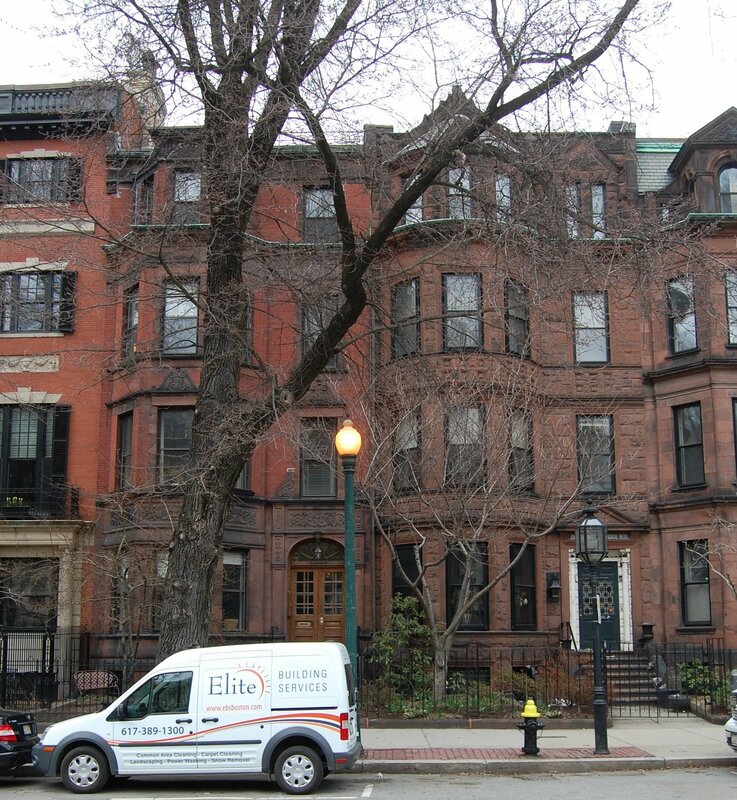 391 Commonwealth is located on the north side of Commonwealth, between Massachusetts Avenue and Charlesgate East, with 389 Commonwealth to the east and 393 Commonwealth to the west. 391 Commonwealth was designed by architect Obed F. Smith and built in 1885-1886 by Charles H. Dodge, mason, for building contractor George Wheatland, Jr., for speculative sale, one of six contiguous houses (381-383-385-387-389-391 Commonwealth). George Wheatland, Jr., is shown as the owner on the original building permit application for 381 Commonwealth, dated December 15, 1885. At the same time, George Wheatland, Jr., was having six more houses built at 430-440 Marlborough, on the lots to the north, behind 381-391 Commonwealth, also designed by Obed Smith and built by Charles Dodge. 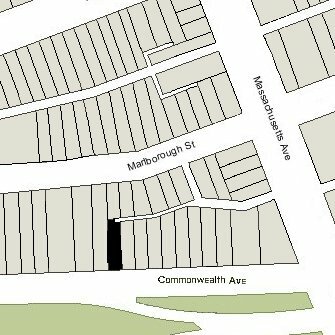 Click here for an index to the deeds for 391 Commonwealth, and click here for further information on the land west of Massachusetts Avenue between the south side of Beacon and the north side of Commonwealth. On January 7, 1889, 391 Commonwealth was purchased from George Wheatland, Jr., by Josiah Bradlee Kendall. He and his wife, Elizabeth (McPherson) Kendall, lived at 389 Commonwealth. He was a stone and granite merchant and subsequently became a real estate dealer. 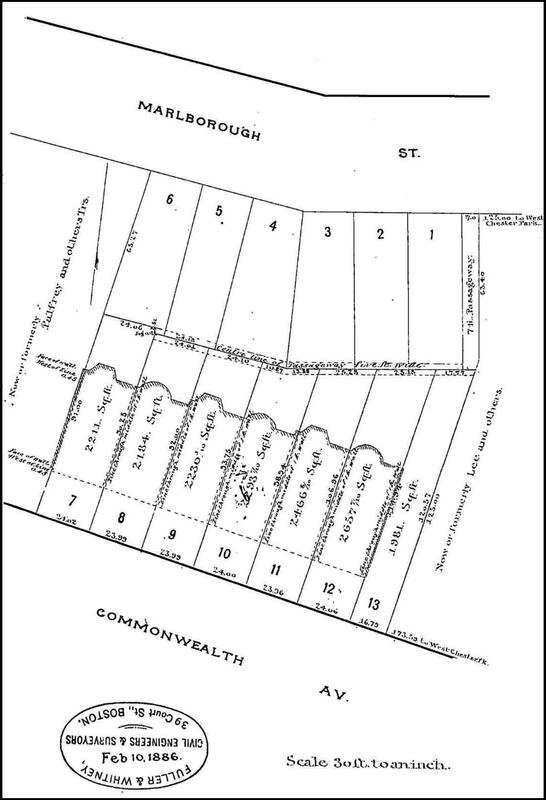 On September 16, 1889, 391 Commonwealth was purchased from Josiah Kendall by Rosamond (Lawrence) Peabody, the wife of Francis Peabody, Jr. They previously had lived at 230 Beacon. Francis Peabody, Jr., was the son of Samuel Endicott Peabody and the grandson of Francis Peabody. However, he was called Francis Peabody, Jr., to distinguish him from his uncle, Francis Peabody. Francis Peabody, Jr., was an attorney. In 1894, he was the Democratic nominee for Mayor of Boston, and was narrowly defeated by the Republican, Edwin Upton Curtis. The Peabodys continued to live at 391 Commonwealth during the 1895-1896 season, but moved thereafter to Milton. On February 20, 1896, 391 Commonwealth was purchased from Rosamond Peabody by Francis Inman Amory, trustee under the will of William Amory, for the benefit of Ellen Sears (Amory) Anderson, the wife of John Francis Anderson. Francis Inman Amory and Ellen (Amory) Anderson were the children of William Amory and his wife, Anna Powell Mason Sears. Ellen Anderson made 391 Commonwealth her home. She previously had lived at 455 Marlborough with her son-in-law and daughter, Francis Stanley Parker and Harriet Amory (Anderson) Parker. Ellen Anderson’s husband, a dry goods merchant, lived in Portland, Maine. Ellen Anderson died in May of 1908. On August 10, 1908, 391 Commonwealth was acquired from Ellen Anderson’s trust by Josephine (Moore) Dexter, the widow of Chicago attorney Wirt Dexter. She lived at 393 Commonwealth. 391 Commonwealth was not listed in the 1909 Blue Book. By the 1909-1910 winter season, 391 Commonwealth was the home of Thomas Pelham Curtis and his wife, Frances Kellogg (Small) Curtis. They previously had lived at the Hotel Canterbury at 14 Charlesgate West, before that in an apartment at The Chesterfield at 371 Commonwealth, and before that at 120 Marlborough. In 1894, Thomas Curtis had been a member of the Boston Athletic Club team that participated in the first Olympics, held in Greece. He won the 110-meter hurdles (gold medals were not awarded to first place winners until later Olympics). He was an engineer in the electric wiring and construction businesses, associated with his MIT classmate, Frederick W. Lord. Frances (Small) Curtis was a leader in the Massachusetts movement for women’s suffrage. 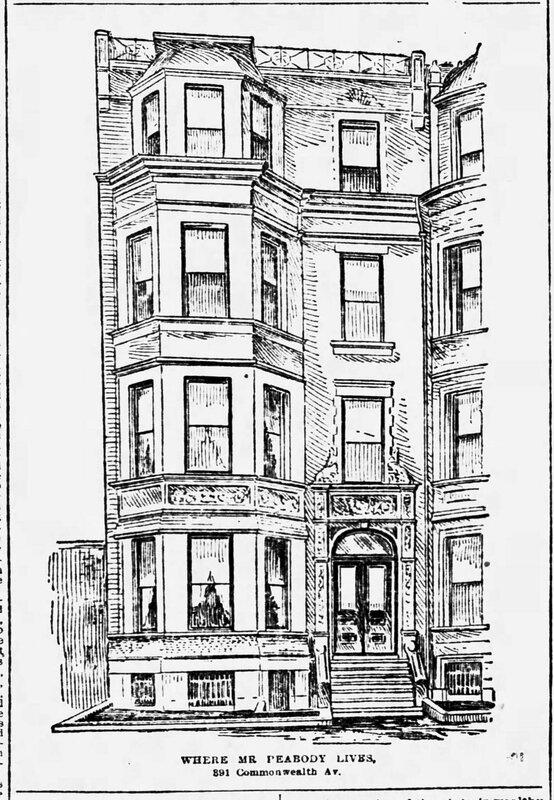 They continued to live at 391 Commonwealth during the 1910-1911 season, but then purchased and moved to 447 Beacon. On February 1, 1911, 391 Commonwealth was acquired from Josephine Dexter by Ellen Anderson’s daughter, Harriet (Anderson) Parker. She and her husband, Francis Stanley Parker, made it their home. They previously had lived at The Chesterfield at 371 Commonwealth. They also maintained a home in Bedford, which had been their primary residence since they moved from 455 Marlborough in about 1894. Francis Parker was a wholesale coal dealer. Francis Parker died in January of 1916. 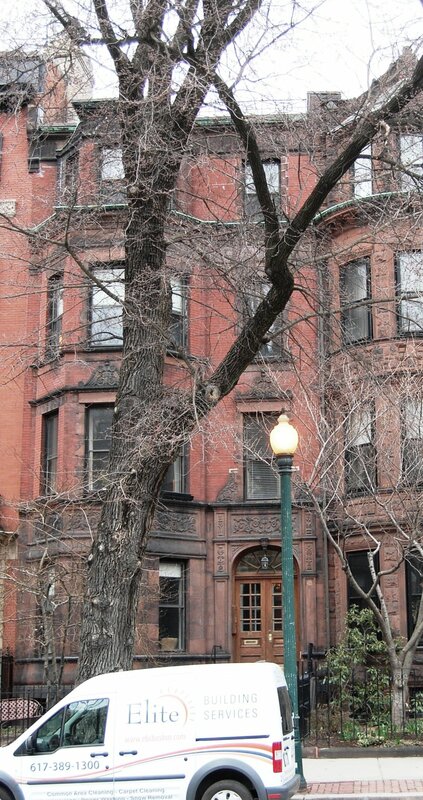 Harriet Parker continued to live at 391 Commonwealth until about 1944, when she moved to 68 Beacon. On July 27, 1944, 391 Commonwealth was acquired from Harriet Parker by her son, William Amory Parker. On October 9, 1944, 391 Commonwealth was acquired by Mrs. Elizabeth Ann (Joyce) Broderick, the former wife of Walter Michael Broderick. She previously had lived in an apartment at 333 Commonwealth. Elizabeth Joyce Broderick owned a direct mail advertising company, the Joyce Letter Shop at 462 Boylston. In November of 1944, she applied for (and subsequently received) permission to convert 391 Commonwealth from a single-family dwelling into two apartments, one on the first and second floor, and the other on the third floor. She specified that she would not use the fourth floor unless and until a second means of egress was provided. In August of 1948, she applied for (and subsequently received) permission to increase the number of apartments from two to three (presumably having provided the necessary egress from the fourth floor). In September of 1952, she applied for (and subsequently received) permission to build a one story addition at the rear of the property for use as a kitchen. Elizabeth Broderick continued to live at 391 Commonwealth until about 1953, when she moved to Chestnut Hill. On August 31, 1953, 391 Commonwealth was purchased from Elizabeth Broderick by Jean Baldwin (Dunning) Toohey, the widow of Peter Bernard Toohey. She previously had lived at in an apartment at 382 Commonwealth. In February of 1954, she filed for (and subsequently received) permission to legalize the occupancy of 391 Commonwealth as four apartments. She continued to live in one of the apartments at 391 Commonwealth until 1957. 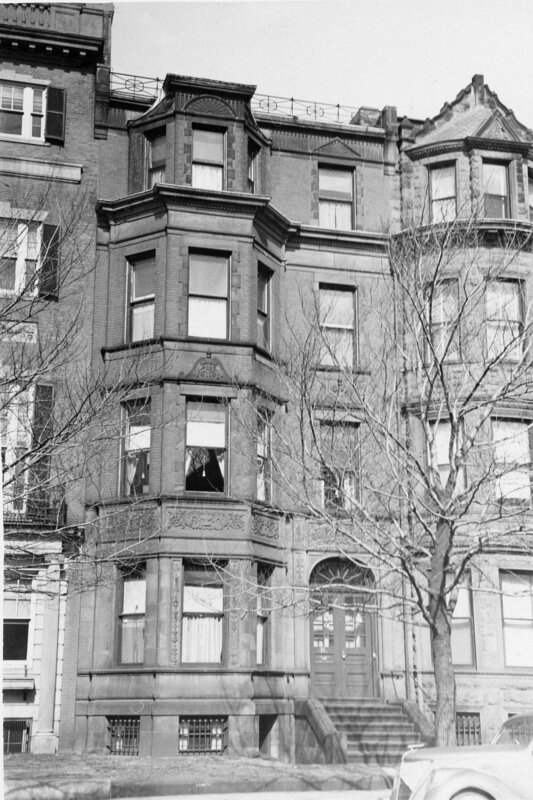 On November 5, 1957, 391 Commonwealth was acquired from Jean Toohey by Gerald Thomas Dugan and his wife, Katherine (King) Dugan, who lived in one of the apartments. They previously had lived in Wellesley. Gerald Dugan was regional manager for the California Oil Company. In May of 1958, they filed for (and subsequently received) permission to convert the property from four to five apartments. The Dugans continued to live at 391 Commonwealth until about 1961, when they moved to Millis, Massachusetts. On September 26, 1961, 391 Commonwealth was acquired from the Dugans by Ethel (Carlson) Dunlop, the wife of Kenneth Clyde Dunlop. They lived in one of the apartments. They previously had lived in Brookline. He was a retired insurance broker and former lawyer. Kenneth Dunlop died in November of 1976. Ethel Dunlop continued to live at 391 Commonwealth until her death in August of 1981. On September 28, 1982, 391 Commonwealth was purchased from Ethel Dunlop’s estate by Dorothy F. Wirth and Susan F. DeAngelis, trustees of the 391 Commonwealth Avenue Realty Trust. On May 26, 1983, they converted the property into five condominium units, the 391 Commonwealth condominium.